I don’t even know what the purpose of reviewing TV is after watching this episode. “Tricksters” featured, among many other things, Mark Hamill playing a costumed supervillain and uttering the line “I am your father.” The Flash has essentially won television at this point. Needless to say, this was a really enjoyable episode. We saw the show at its most campy and comic book-y with the two Tricksters (Hamill and Davon Graye), but we also saw moments of real darkness and solemnity as the true nature of Harrison Wells was further illuminated. The end result was a real jam-packed installment that reinforces the idea that The Flash, when it’s firing on all cylinders, can do superhero TV better than anyone. Variety announces Paramount has cast ARROW's Stephen Amell as Casey Jones in the 2016 sequel to TEENAGE MUTANT NINJA TURTLES. 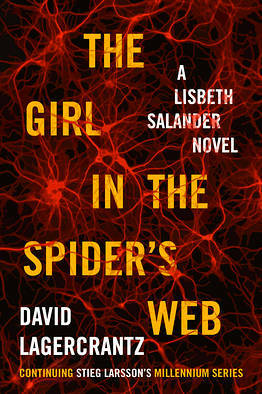 The Girl in the Spider's Web, the fourth installment in the best-selling Millennium series by Stieg Larsson, will be published in the U.S. this September. The novel comes on the heels of two previous sequels, The Girl Who Played with Fire and The Girl Who Kicked the Hornet's Nest. According to a statement released by Alfred A. Knopf, Spider’s Web will include “the introduction of Silicon Valley as a locale and a character from the National Security Agency in a central role." Spider's Web notably marks the first novel in the series not written by Larsson. Instead, Swedish writer David Lagercrantz, a former crime journalist and novelist, took over for Larsson, who died of a heart attack in 2004. Lagercrantz was chosen by the Larsson estate and the author's Swedish publisher, Norstedts, to continue the Millennium books. The contrast was particularly effective because in the not too distant past we saw Liv feeling optimistic about a permanent cure. Now she not only has to wrestle with the fact that it's possible to become a worse version of herself but that maybe she can cross a point of no return. All of these facets combine to create an enticing mix that enriches the series and makes watching Liv's development more fascinating. A very strong episode, “One Door Closes” surprisingly seemed to upend the dynamic of this show again, while also including some cool flashbacks that filled in the origins of The Other SHIELD. Man, the producers sure took those “the pacing is too slow” criticisms from Season 1 to heart, no? I assumed we’d get at least a few more episodes of Bobbi and Mack plotting with Gonzalez before any kind of major confrontation occurred – but nope, everything went down here! Coulson figured out Mack was up to something, Bobbi got Fury’s toolbox and than Gonzalez and his SHIELD agents all showed up and took the entire place over! After its Wolfe-centric two-parter, Powers slowed things down this week with "The Raconteur of the Funeral Circuit" - a quasi-bottle episode (it did cut away to Krispin and Royalle occasionally) spent mourning the four officers killed in the bloody rampage. A bit of it was spent digging a bit more into Pilgrim's character, and how she's had to grow up with a very popular, but very dirty, celebrity cop as a father. But even with that - plus Retro, Walker, and Triphammer all in full reminisce-mode - I'm still not latching onto these folks. Six episodes in and a lot of this show leaves me cold. Every so often, the show will drop in some interesting backstory, or plant seeds for things that could wind up being exciting down the line, but more often than not there's a hollowness. Perhaps a lot of that has to do expressly with the fact that so much of this tale lives in the past. More time is spent on this series explaining things that already happened than anything else, and the stuff that is happening in the now is spotty. Royalle's whole Sway storyline has now become "He doesn't know what Sway is actually doing to people." Which I'm sort of happy is now actually being acknowledged, though it doesn't exactly make up for the fact that we've been watching a mystery drug more or less do whatever the story needed it to do for the past five episodes.